Individuals with a learning disability are able to lead a full and satisfying life in the community, with support as many do, however, for others they find themselves being isolated, pushed away to the boundaries of society. Research has shown that a significant number of people with a learning disability diagnosis encounter prejudice, bullying, and discrimination in some form or another, at some time in their life. Such treatment has a very damaging impact on a person’s to lead a productive, full and inclusive lifestyle. In order for these attitudes to change and if we are to achieve our goal of a modern society in which everyone is valued and has the chance to be included in all aspects of community life. There has been some progress, often through the efforts of families, voluntary organisations and people with learning disabilities themselves but so much more still needs to be done. People with learning disabilities are amongst the most vulnerable and socially excluded group in our society. Research has shown that few have meaningful employment, hold their own tenancy or live in their own homes, or have choice where they live and who provides care and support for them. These needs to change: people with learning disabilities must no longer be marginalised or excluded. Valuing People sets out how the Government will provide new opportunities for children and adults with learning disabilities and their families to live full and independent lives as part of their local communities. Learning disability is one of the most common forms of disability and affects up to 1.5 million (2% of the population) people in the UK. It is a lifelong condition. An impairment that started before adulthood, with a lasting effect on development. This means that the person will find it harder to understand, learn and remember new things, and means that the person may have problems with a range of things such as communication, being aware of risks or managing everyday tasks. In UK education services, the term ‘learning difficulty’ includes children and young people who have ‘specific learning difficulties’, for example dyslexia, but who do not have a significant general impairment of intelligence. The Special Educational Needs codes also use the terms ‘moderate learning difficulty’, ‘severe learning difficulty’ and ‘profound multiple learning difficulty’, which relate to general impairments in learning of different severity. World Health Organization (WHO) has defined learning disabilities as a state of arrested or incomplete development of mind. Somebody with a general learning disability is said to have a significant impairment of intellectual, adaptive and social functioning. A learning disability is not acquired in adulthood and is evident from childhood. But what does this mean to the public as a whole. What are people’s understandings of learning disabilities? A study is going to be conducted to determine lay terms of what people think a learning disability is. The study will take place at Ystrad Mynach College and will involve ay willing participants aged between 16-65. To collect sufficient data 100 people will be asked. Aim; to gain a broad understanding of people’s perceptions of the term learning disability and how attitude can contribute to social exclusion and access to mainstream services. Surveyed 100 people categorising between the ages of; Ages: 16 – 20, 21-25, 25- 30, 31-45, 46-65. Asked; Age Range – To determine how people’s understanding changes with maturity, experience, knowledge? Asked; Nationality – Does culture play a part in understanding? Asked; Open Question – How would you define learning disability? Gives an opportunity to write an understanding of the term in your own words. Test if education, knowledge and discussions have played a part in changing attitudes or have in fact attitudes changed at all? How would you define a learning disability? Open question – As opening questions in a conversation, as it makes it easy for the other person to answer, and doesn’t force them to reveal too much about themselves. An open question is likely to receive a long answer. They ask the respondent tothinkand reflect. They hand control of the conversation to therespondent. When opening conversations, a good balance is around two/three closed questions to one open question. The closed questions start the conversation going and summarise progress, whilst the open question gets the other person thinking and talking opening up discussion. Diversity – The diversity, age, nationality, background, within and between individuals of lay people must not be overlooked. Knowledge – It is recognised that lay people ‘may’ lack knowledge about the subject in question or may have a good understanding but may not know the ‘key words’, ‘buzz words’. Power relationships (perceived) between researcher and researched may prevent lay involvement. Resources – lack of time can be barriers to active lay involvement in research. Key words or Phrases used to compartmentalise the ‘general’ understanding of the term learning disability, which briefly means in considering or including only the main features or elements of something; not exact or detailed. Generalised Terms – inability to learn fluently, affects learning, one step behind, hard to learn, inhibits learning, time to learn, struggle learning, unable to learn same way as other people, hard to learn, help with tasks, needs assistance, needs support, learns differently, not in mainstream services, problems learning new skills. Place in a particular class or group. 8% of total surveyed was unable to identify with the term or its meaning. 16-20 British “When something is harder for you than others”. 7% of 16-20 year olds in this category showed a good understanding, lack of discrimination and non compartmentalise of ‘disability’. 1% of 21-30 as above. Putting the literature into categories into the chosen sections seemed, at first, to be a straightforward task. But once the gathering of information had started, it became clear that it would not be so simple. Each category overlapped in some ways and each answer had different interpretations depending on who was reading the survey forms. The generalised format of the survey form may have made it more difficult to determine one definitive answer, each answer raised another question and was another point of discussion and reflection, or maybe that was my intention? I considered different ages of people, targeting other students, lecturers, staff within the college environment, on reflection I would have broadened my group to include possibly 25% of each age group and asking a broader area of the general public. What became obvious from my survey is how the understanding of the term learning disability has changed in the age group 16 – 20 with a high percentage actually having a clear understanding of what it means and actually explains it in a positive way. I we consider these students being involved in the social care field it is refreshing to think that they do not see disability as a barrier to learning but just a different way to learn. These 16-20 year olds may be our next teachers, social workers, nurses, advocates etc, or a proportion may have a diagnosis and may explain some of the heartfelt quotes in section 5 of the survey, two which I found to be most pertinent, 16-20 British “I find it difficult to be on my own”, 21-30 Welsh “Just got to work with it”. On hindsight I should have broadened my subject and sent surveys to; schools, carers group, statutory services, voluntary services but even then I suppose it is still difficult to ensure that you reach within an acceptable margin of individuals within the same age range across the board. I considered whether to add more specific questions to the survey i.e. name, occupation, gender, religion, I struggled with this for several days before coming to a decision. My research showed me that now most surveys are anonymous, they tend not to record either the name of the respondent, or the name of anybody that the person may represent. This may been seen as inconvenient if you realise that you may need more specific data after collecting responses, or clarification on a comment/answer, or investigating subsequent research questions. I had considered asking for an email address, but stress that this should be optional. The drawback is if email addresses are collected, your data will then be subject to the terms of the Data Protection Act and open to all kinds of legislation? Should I have incorporate demographic data, age, gender, education etc, but felt that this should be minimised, did I need it, should you collect any demographic data unless it is related to a specific research question? In my case a little more ‘specific’ information may have clarified my findings. However, again demographic data may include personal details that would bring your research within the terms of the Data Protection Act, in which case precautions need to be considered, and more specific, closed questions prevent some people from completing the survey if they think that they can be identified from their answers, would an honest answer be given at all ?. It should be explained to participants that voluntary completion of a questionnaire or interview can be taken as consent for this data to be used in research and that nobody should ever be compelled to participate in a research survey, for example, the students from Ystrad Mynach College should not be required to participate in research as a condition of for example their course grading. This was another reason why I used general non identifiable questions and participants could see the simplicity of the survey and that no personal data is collected. Research has shown that only a percentage of the participants that are approached via a database to carry out surveys will complete them, figures suggest between 5% to 50%. I had considered this prior to setting up my survey and wanted to ensure that I had my 100% completed. I took a more pro-active approach where I physically approached every single person, told them what I wanted to achieve from the survey, (ideally my results would have been more applicable to a larger number of people beyond those that I was able to interview in the time-scales), but at the time I felt I had a representative sample, (I am not so sure now). The other positive, although more time consuming doing the face-to-face interviews you can be sure that those who did respond have given the answer themselves, they are not biased, researched or influenced by others. Also, if a person refuses to complete the survey you may be able to establish what are the reasons why they may not respond, might these be related to any of the questions? I would still use closed questions as a basis for statistical comparisons, either investigating differences between groups within the sample, or correlations between responses to questions. Survey responses are not generally particularly sensitive measures, so the statistical techniques available might not be straightforward as I have found out. Much debate surrounded my open questions, and how I should draw conclusions about the patterns or trends across their answers? I found the most appropriate way involved creating a set of coding categories, assigning each answer to one or more categories, and dealing with those that fell outside the coding scheme, are ambiguous and so on. I asked a second person to re-code the same data, to make a statistical inter-related reliability analysis, (second opinion), brainstorming. It was the case that I did not have a research hypotheses relating to the open questions which did cause conflict in my thinking and analysis. On reflection it is probably unwise to collect large amounts of verbal data without having a firm plan in advance of how it will be analysed. What did my Survey tell me? 21 – 45 attitudes appeared more general to categorising, (labelled the person, saw the disability and then the person). Most had some understanding but their responses were more ‘text-book’ definition. 46-65 year olds in the majority had more ‘preconceived’ ideas again saw the disability and not the person. "Public Attitudes Towards Learning Difficulties." UKEssays.com. 11 2018. All Answers Ltd. 04 2019 <https://www.ukessays.com/essays/health/public-attitudes-towards-learning-1424.php?vref=1>. "Public Attitudes Towards Learning Difficulties." All Answers Ltd. ukessays.com, November 2018. Web. 26 April 2019. <https://www.ukessays.com/essays/health/public-attitudes-towards-learning-1424.php?vref=1>. UKEssays. November 2018. Public Attitudes Towards Learning Difficulties. [online]. Available from: https://www.ukessays.com/essays/health/public-attitudes-towards-learning-1424.php?vref=1 [Accessed 26 April 2019]. UKEssays. 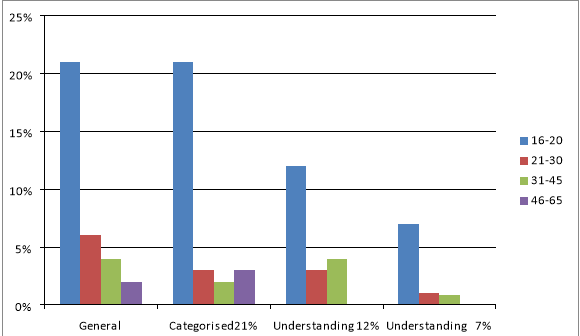 Public Attitudes Towards Learning Difficulties [Internet]. November 2018. [Accessed 26 April 2019]; Available from: https://www.ukessays.com/essays/health/public-attitudes-towards-learning-1424.php?vref=1.